Good hotel for the price But I didn’t have HOT WATER ! Room was spacious, quite large actually , although the furniture seemed old and inadequate . Bathroom was spacious and fantastic. Also the bed was great, very comfortable. The staff were awesome! Security personnel were alert and Professional! I like everything, the service was extraordinary. Even though I do not speak Spanish but they understand me a bit and tried to speak English..Nicole , dagris, wilma, Linet those receptionists was beyond excellent . Raphael, Negrito best and friendly taxi driver and Malco super nice...I enjoyed every bit of my time with them. Breakfast is the same every single day. I was tired with the eggs and breads past due. It has a nice setup in the back in the pool area. Awesome Service, staff is great!!! Bathroom is huge!! Ramada by Wyndham Princess Santo Domingo This rating is a reflection of how the property compares to the industry standard when it comes to price, facilities and services available. It's based on a self-evaluation by the property. Use this rating to help choose your stay! One of our top picks in Santo Domingo.This modern hotel is located in Santo Domingo City Center and features a casino, free breakfast and a fitness center. 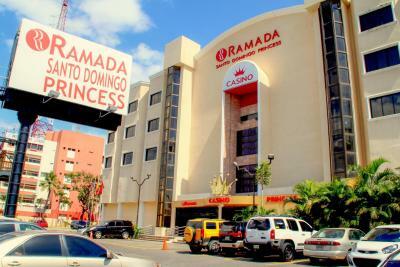 Ramada Santo Domingo Princess Hotel y Casino offers free Wi-Fi. Each spacious room at this property includes a wardrobe and a small seating area. They also boast flat-screen TVs and a safety-deposit box. Guests will find other restaurants serving national and international cuisine within 0.6 mi. Santo Domingo’s trendy colonial area, where guests will find street-side cafes, bars and art galleries, is a 10-minute drive away. Los Tres Ojos cave and park is a 15-minute drive from Ramada Santo Domingo Princess Hotel y Casino. Guests can reach Las Americas International Airport within a 25-minute drive, while the popular Playa Boca Chica Beach is about 19 mi from the property. 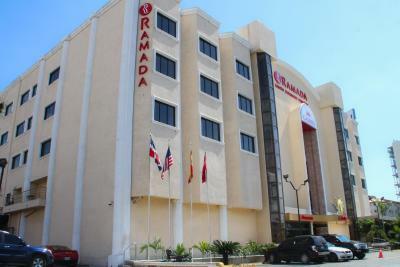 When would you like to stay at Ramada by Wyndham Princess Santo Domingo? 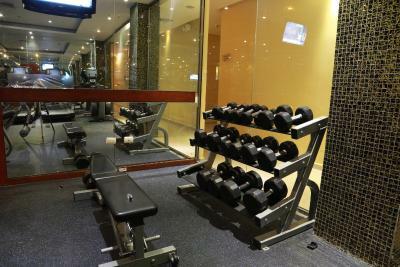 House Rules Ramada by Wyndham Princess Santo Domingo takes special requests – add in the next step! 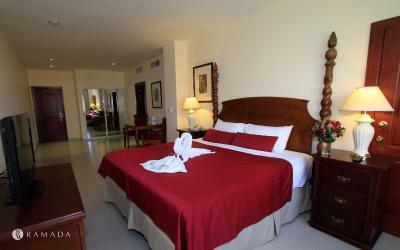 Any additional children or adults are charged USD 12 per night for extra beds. Ramada by Wyndham Princess Santo Domingo accepts these cards and reserves the right to temporarily hold an amount prior to arrival. Disco located in the hotel..I did not go to bed until 5am, that's when the disco closes. Bass was so loud my window vibrated until 5am....I missed my appointment the following day and my sleep was completely wrecked due to this...Staff said it was a private owner of the disco and they always get complaints but there was nothing they could do....This was a joke, what a unprofessional answer. Great pool/pool bar..great breakfast...great staff/managaemnt. I can't complain at all. The bed was hard. The room was freezing. The bathroom door did not shut at all. The door to the room we had to push hard to close. The food was ok. The breakfast eggs were gross and too runny for our tastes. It is nothing like how the ramada is in the United States. We were very disappointed and will not be staying again. Also the water did not get hot in the shower. That was disappointing too. We also saw some cockroaches in the hallway, but I know on a tropical island that's tough. I didn't like the noise. We were almost unable to sleep because of the noise from the street and people outside the hotel. And we were on the fourth floor, but the noise traveled as if they were right outside the window. Also even the noise from the adjoining room was so audible, like even a cough, and other activities I will not describe here. I dont know if it's because of the casino or the disco club in the hotel, but there was excessive loud noise from people into the wee hours of the morning. The decor of the room seemed dated and almost like an afterthought. Also there was no refrigerator in the room, which here in DR for the price paid for this room you would usually have. Included breakfast was only average at best. Overall I don't think it was value for money. Expected more from Ramada and Wyndham.... Both brands I know well from other locations. Only real facilities are the casino and the late night disco club. The bathroom was great with a separate room for toilet and tub, but the shower head on the hose didn't work, only the very large shower head worked, see pic. The cold water from the warm faucet! !